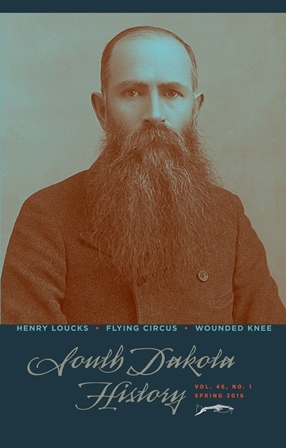 Agitator Henry L. Loucks, World War I military air shows and events at Wounded Knee are chronicled in the Spring 2016 issue of “South Dakota History,” the quarterly journal of the South Dakota State Historical Society. “‘Equal Opportunity for All, That’s All’: South Dakota’s Henry L. Loucks and the Fight for Reform, 1885–1928,” profiles the Deuel County farmer who rose to national prominence as a leader in the Farmers’ Alliance movement of the 1880s and 1890s. Although Loucks and his fellow reformers failed to create a viable third party in South Dakota, they left a lasting legacy with the initiative and referendum process now enshrined in the state constitution. The article’s author, Jeffrey A. Johnson, is an associate professor at Providence College in Rhode Island. In his article, “Flying Machines and War Bonds: The Victory Loan Flying Circus in South Dakota,” Alan L. Roesler documents the South Dakota performances of a military aircraft demonstration team that toured the Midwest to promote the sale of bonds to finance World War I. The air shows entertained large crowds in Aberdeen, Redfield and Sioux Falls in April 1919. Roesler, a retired geologist in Mesa, Ariz., is a member of the League of World War I Aviation Historians. Jerome A. Greene, a retired National Park Service historian, presents a never-before-published account of Wounded Knee and its aftermath in “An Artilleryman at Wounded Knee and White Clay Creek, 1890: The Reminiscence of Private John W. Comfort.” Comfort’s memoir is the only known enlisted artilleryman’s perspective of the turmoil that left at least 200 Lakotas dead, with many more injured, and resulted in 66 army casualties. Greene provides explanatory notes and maps to help readers follow events. “South Dakota History” is a benefit of membership in the South Dakota State Historical Society. For information on membership, call (605) 773-6000. Individual issues may be purchased for $10 plus tax and shipping by calling (605) 773-6009.